Domaine du Verdon luxury camping site is nestled between the rich rolling hills in surrounding Castellane in the popular Provence region. If it's the great outdoors that captures your roaming spirit, you'll love this destination as it is right beside the renowned Gorges du Verdon landmark. To book your mobile home in this idyllic hideaway, call LUX-camp today. 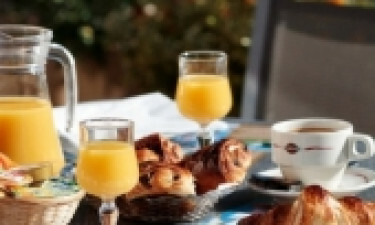 What's special about Domaine du Verdon luxury camping? Only 1.5 km from Castellane town. Great pool complex for all the family to enjoy. Domaine du Verdon is for active families, so for that ultimate camping holiday, you might want to enjoy a few evenings right under the starry skies. There's a number of landmarks surrounding the site that are well worth a visit. The Gorges du Verdon is one of Europe's most beautiful river features, with stunning surrounding views and crystal clear surfaces. There are some fantastic hiking trails encircling the gorge, but the best way to view this majestic landmark is to take a canoe down through the rapids. If you like climbing, the rocky terrain throws up many opportunities for vigorous exercise. 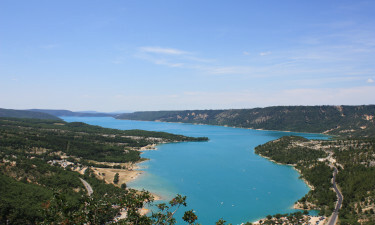 Domaine du Verdon campsite is only 1.5 km from the town of Castellane. It is a typical French village with medieval architecture and quaint, little alleyways and avenues; perfect for a picnic or a leisurely stroll. Stop by for a latte or a nice glass of chilled wine or enjoy the terrace by the towering Notre Dame du Roc which provides a panoramic view of the majestic countryside. Sample some local French cuisine or simply relax and inhale that wonderful Atlantic air. Domaine du Verdon holiday resort has a restaurant on site where you can avail of international and traditional dishes indoors or on the terraced seating. The site also has a take-away and a lovely pizzeria, and when you want to have a drink or two pop into the resident bar. Domaine du Verdon campsite has a mini-market so you can stock up on regular grocery items like fruit, vegetables, fresh daily bread and pastries, coffee and wine. The town of Castellane is only a short distance away should you need to purchase further camping essentials and sundries. Don't forget to sample some of the many local wines on offer.